DISCLAIMER – I am NOT an expert, merely a collector of information! Given that, I wanted to share with you some resources so when you get ready to set a quilt ON-POINT, you are not running scared! I decided to share on the blog today, information I had shared in a reply to a follower about her own project. I realised the reply was so long it was worthy of a blog post. 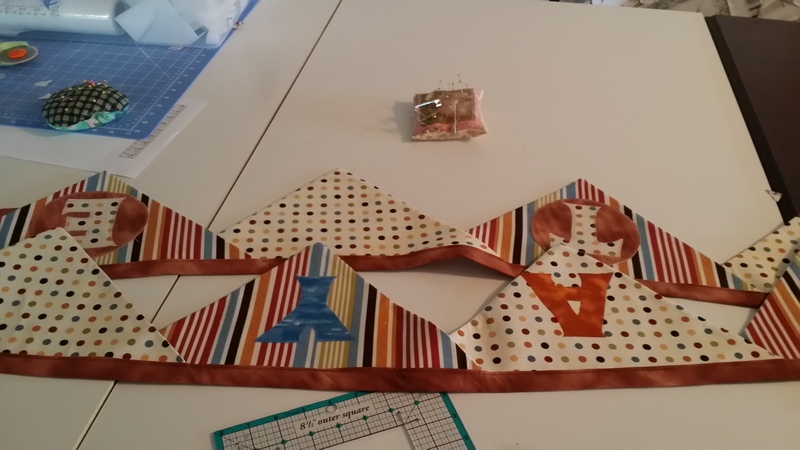 Note – my rows are in progress and I will be trimming off the white “overlap” even with the outer edge of the burgundy triangle. When my fellow blogger, Judy, commented about how she was setting her current project and asked me “technical” questions, I went back to my favorite source for information – Bonnie’s Tips and Techniques Tab . I scrolled down through her numerous tips until I got to this great chart and tutorial –http://quiltville.blogspot.com/2005/06/on-point-quilts.html– She has such great info. You can follow along with her discussion and get to the hard “math” stuff, and then go to the chart. To back track a little, the quilt I am currently working on (Allietare Mystery Quilt) has set in triangles/corners, and my experience in the past was to STARCH the SQUARE HEAVILY before I cut it in quarters or halves. This will really help as you can experience all kinds of stretch with those bias edges along the outer edge. STARCH is your best friend when dealing with triangles I believe. Bonnie also tells you what to do if you “sash” a quilt on point. 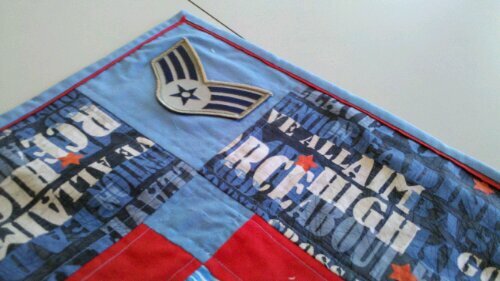 I used that info when I worked on the quilt for our outgoing president of the quilt guild. Sashing and on point example. There is also an app for your cell phone from Robert Kaufman Fabrics/Quilters Paradise. It is a free app. They have a set-in and corner triangle calculator. Quilting Calculator App (Go to this link for more information about the FREE app for Android & I-phones). I use that app alot when I am out shopping; when I am working in my sewing room trying to figure out how many 3.5″ squares I can get from a fat quarter etc. Very useful!! I like to “compare” the two – Kaufmann App and Bonnie Hunter’s chart. It gives me CONFIDENCE that I am doing it correctly. My very first quilt on point was from a class I took at Serendipity Quilt Shop, and we were following the pattern information in Pat Sloan’s “I Can’t Believe I’m Quilting” book. (Oh, yes – this quilt is still a UFO….January 2013….partially quilted). That book also had great “ON POINT” information. 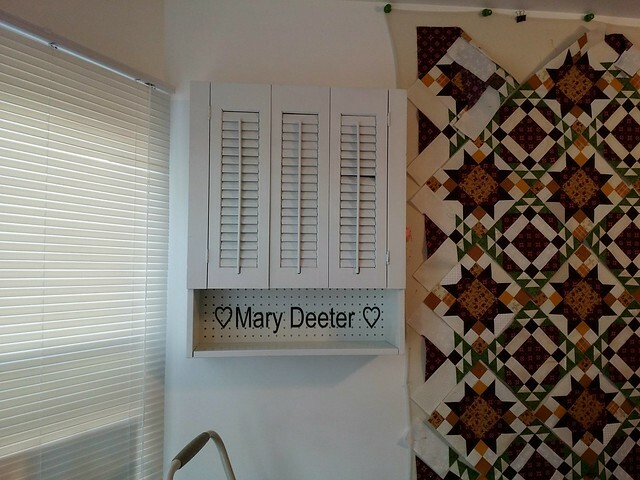 Another quilter I follow, you may be familiar with Aunt Marti – 52 quilts (remember Susies Magic Binding ?) 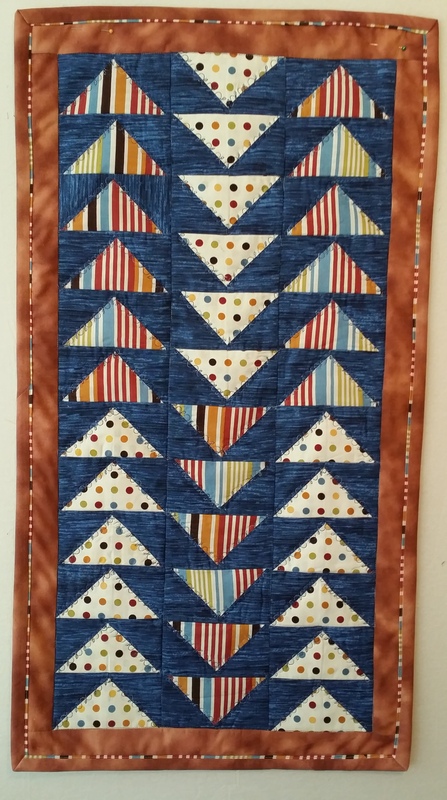 recently had a timely post on setting triangles and on point calculations –http://www.52quilts.com/2015/12/tuesday-tutorial-setting-triangles.html . In her blog post she said ” I love Marti Mitchell’s templates and rulers. The Diagonal Set Triangle ruler #8968 can be used for both corner triangles and setting triangles.” Do go read her post and why she loves that ruler. (Hint – NO BIAS). So, there you are, my wealth of information collection is yours for the keeping. LOVING the way the flange looks peaking out from behind my binding!! This is turning out to be the best finishing touch to an awesome event!! Getting about 1/3 the way around the front side of the quilt…taking a dinner break! Will probably finish in the morning!!! 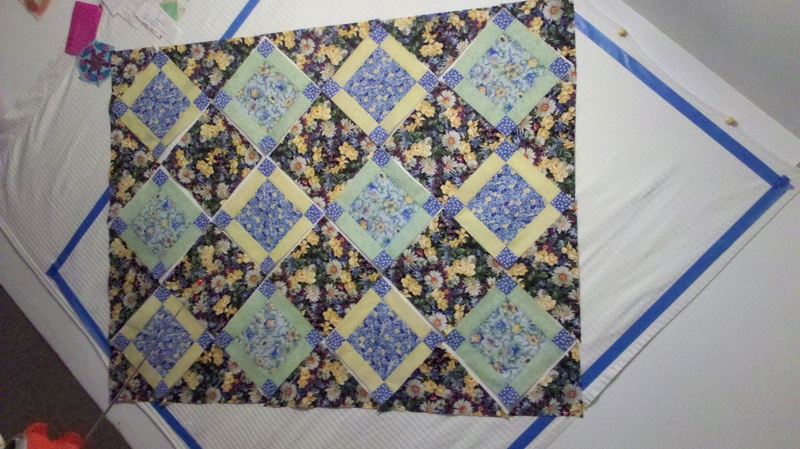 Can’t wait to get the rest of this binding on, take a couple of pictures…then wash this quilt and see “what” happens…. 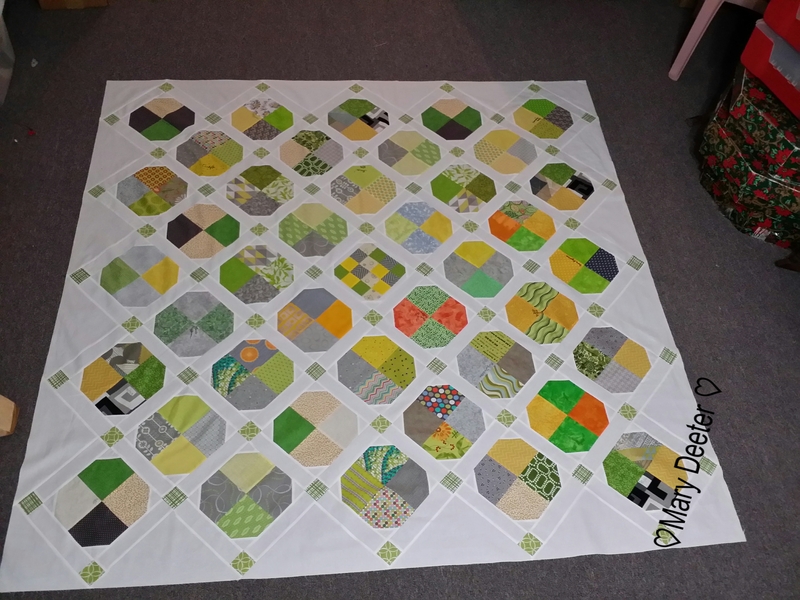 Note; this is an Aurifil March 2013 BLOCK of the Month; Designed by Jeni Baker. Block is called THE BOXER. I just HAD to make the whole quilt with this one block. Sashing and borders are my own design! Thanks especially today to “Aunt Marti” http://www.52quilts.com for the awesome tutorial on flanges in binding! Thanks also to Pat Sloan who hosts Aurifil Block of the Month this year.